This Mediterranean street-food is more ubiquitous—and tastier—than ever. Has youth and innovation triumphed over age and tradition? 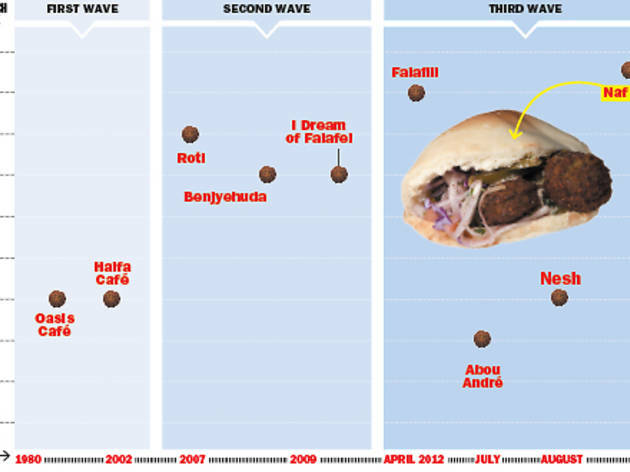 We tasted (almost) every falafel sandwich in the Loop to find out. First-wave Loop falafel joints have minimal ambiance, brusque service and straightforward logic: You order your “falafel sandwich,” and hummus, falafel, lettuce, Jerusalem salad and tahini are quickly assembled into a standard-issue pita. No customization, no aiolis, no slaws. Classic ambiance (the back of a jewelry mart) and creamy, peppery falafel are compromised by unnecessary romaine filler and Jerusalem salad chopped for a giant. The main ingredients (besides crumbly falafel) are lettuce filler and loads of tahini, yet somehow the sandwich isn’t as bad as its sorry parts indicate it should be. Second-wave Loop falafel spots introduced innovation (e.g., Benjyehuda’s upgraded slaws) and corporate promise (e.g., Roti’s and, to a lesser extent, I Dream of Falafel’s eager expansions) to the humble office-worker’s options. Theirs is unlike any falafel in the city—it’s soft and structureless, with whole and smoothly pureed chickpeas tucked into a dark shell. Folded into the signature roti (halfway between a crisp flatbread and fluffy pita) and infinitely customizable (red-pepper aioli? feta? 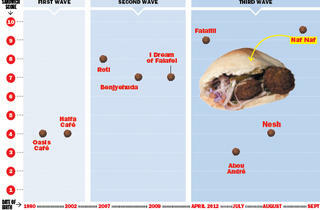 ), it’s proof of falafel’s potential for evolution. By far the best-looking falafel sandwich in the Loop, served by the most chill and friendly staff. And yet the many layers of salads (corn with chopped parsley, cucumber slaw, super-crunchy red cabbage) overshadow the herb-packed, sesame-seed-crusted falafel, making this more veggie pocket than falafel sandwich. Well-seasoned—but a tad greasy—falafel and lackluster, insufficiently applied toppings don’t live up to the great laffa bread, warmed on a panini press after it’s stuffed. Third-wave Loop falafel—namely Naf Naf and Falafill—put a chef’s touch on the street food, bringing the most intriguing condiments and most thoughtfully prepared falafels and pitas the Loop had yet to see. It also saw falafel concepts (Abou André, Nesh) attempting to capitalize on the Loop’s insatiable falafel appetite—without bringing real game. Hand-formed falafel retain the crispest exterior of any, and the pita is crusty on the outside and puffy inside. The DIY toppings bar is a wild card: Do it right and this could be the best in town; do it wrong and you’re SOL. Terrifically fluffy pitas are rolled and baked on-site; well-seasoned, noticeably light (but ever-so-slightly mushy) falafel are carefully dropped (not smashed) inside them; and the toppings—spicy pickled peppers, red-cabbage slaw, thinly sliced onion—combine to form a sandwich of true greatness. Gummy “schrock” wrap is only warm in patches, crispy-edged falafel are heavy and pasty, and basic toppings lack finesse.